The Little Mermaid had the right idea. Under the sea is the place to be! 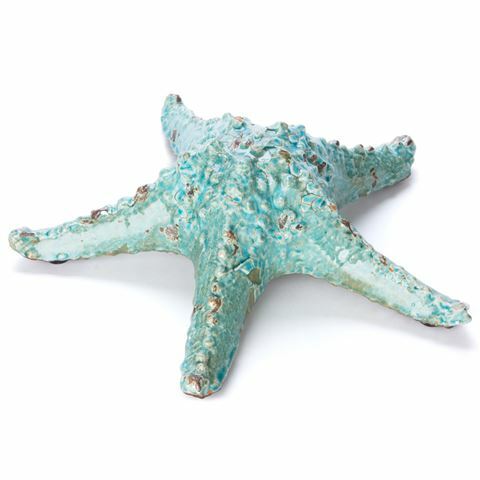 Turn your home into a beautiful, briny underwater paradise in seconds flat with a little help from Avalon’s unique Verde Starfish Ornament. This eye-catching, soft blue piece looks so realistic, even your goldfish will be fooled. Not that you’ll be putting it in your fish tank, though – because ornate pieces like this deserve to be seen! Made from glazed ceramic, this whimsical starfish is modelled on the real thing, with realistic spiny skin like that of true common starfish. Place it on your dinner table, coffee table, a spare shelf or anywhere in your home that could use a touch of beach chic and you’ll swear you’ll be able to hear the sounds of the ocean calling you…even if you live in the Outback. Cool, captivating, curious...Avalon’s Verde Starfish Ornament is all of these things and more, with a capital sea. Starfish spiny skin imitates the real thing. Dimensions: 27cm (w) x 8cm (h).